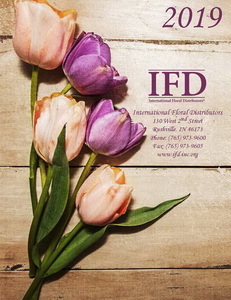 The IFD Catalog is the ultimate product guide representing the most important products used in the creation of flower arrangements and in floral decorating. The IFD Catalog features over 3300 total sku’s. The catalog is used by IFD members to market their products to flower shops, floral decorators and floral designers across the United States. The catalog has thousands of product images covering the major categories of items used as flower design components. In addition, the catalog contains image guides for cut flowers, roses and greens and design how-to pages! More details concerning the catalog’s distribution and reach can is available in the IFD Product Guide Media Kit. For details on how to become part of the IFD Catalog contact the IFD Office Contact Us. Contact your local IFD member NOW!